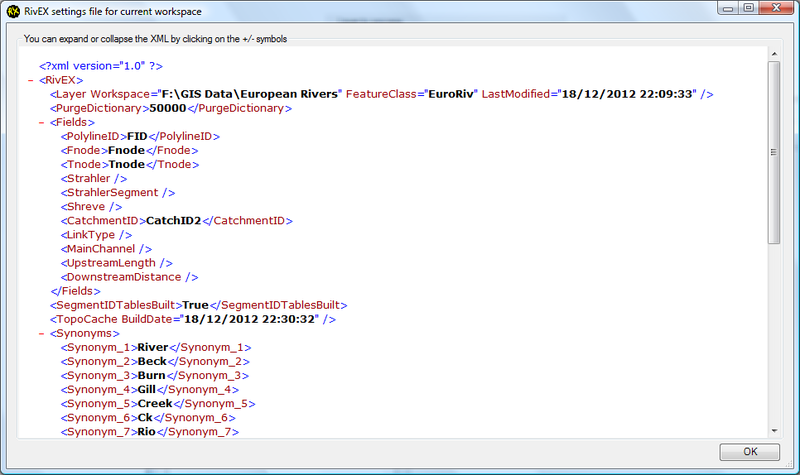 •The RivEX settings file is a XML file that sits in the RivEX_Workspace folder. It maintains a record of field names, outputs and any settings. It must not be altered otherwise RivEX will not be able to re-establish links back to the dataset. As you run various RivEX tools the Settings file is updated and it is sometime useful to see what has been processed. To view the settings file the workspace has to be set and only then does the RivEX settings file button enable (red circle below). •Clicking on the RivEX settings file button opens the window below. You can expand and collapse the tree view by clicking on the +/- symbol next to a node. In the example image below you can see that only catchment ID has been computed and stored in a field called CatchID2. No stream ordering has been done. If there had been, you would see the assigned field name. If you edit the network outside RivEX (e.g. change a field name) then the settings file becomes out of sync and RivEX will fail to process the network. In this case you can attempt to edit the settings file in a text editor or re-run the specific tool (recommended).